Many trees have an irregular shaped crown. 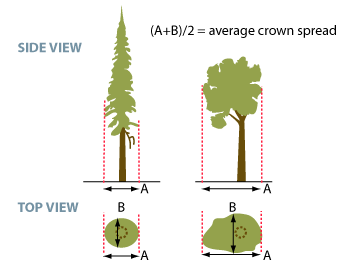 To account for this, crown spread is measured from branchtip to branchtip in two directions and then averaged. The first measure is taken where the crown is the widest. The second is taken at 90 degrees to the first, again where the crown is widest. Crown spread can be measured on the ground with a measuring tape or with a hypsometer.